4 months and going strong! I know for many people I know breastfeeding for 4 months is a drop in the bucket but after my experience with Jack, yesterday was an exciting milestone for Colin and I! Many of you will remember that I had HORRIBLE yeast after I gave birth to Jack. 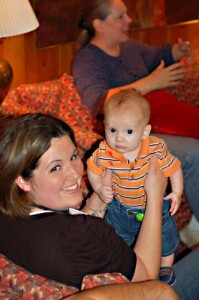 I didn’t know I had it and so I didn’t know to treat it or how to describe the pain I had to my lactation consultant. 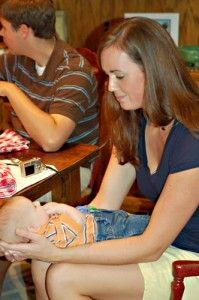 I was extremely committed to breastfeeding but as the days and weeks went on the pain in my breasts became unbearable. I felt like I was producing glass shards instead of milk. I would bawl my eyes out every single time I would nurse – for 4 months. I started to sink into a deep depression but thought it was my “duty” to breastfeed, so I endured. It finally became something that everyone around me knew was something I needed to end but it was very hard for me to admit because of my own pride and what I felt I was depriving Jack of. I felt like a failure. It was a horribly sad time in our household. I still cry when I think about it. On father’s day of 2007 I told Alan that it was time to stop but that I wanted to make sure I always remembered my last time nursing Jack so I just said that that would be it. My milk had all but dried up and so I didn’t want to wake up one morning and realize I would never have that “last time” with him. After all the crying (bothmine and Jack’s) and frustration and pain we had the most glorious time nursing that afternoon. God gave me such a wonderful gift that day. He clenched my thumb and suckled away. He even fell asleep. It was beautiful. 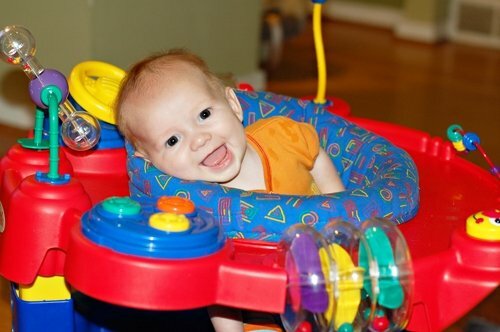 Jack grew up to be a healthy, smart, active boy and the ‘mama guilt’ quickly faded as we both got healthy and moved on – bottles of formula in hand. Yesterday Colin turned 4 months old and nursing him has been such a joy! The yeast started to come back when he was a few weeks old, but I knew what it was and treated it quickly. He is also healthy and thriving! There is no pain, no tears (other than a few tears of joy) – just good healthy nursing! We went to the pediatrician this morning for his 4 month well visit and although he is not quite the hoss that Jack was, Colin is growing well. He is still a little thing; only in the 25th percentile for weight at 14 lbs. He is obviously growing and healthy so I will just be grateful that I will have a petite baby for a little while longer. Sabrina (our pedi) asked if I had any concerns or problems with Colin. I said “are you kidding? He is perfect!” I mean it too. This is the face I get to stare at all day. What could be more perfect? Labor Day weekend the Melson clan carted off to Shreveport to visit lots of family. 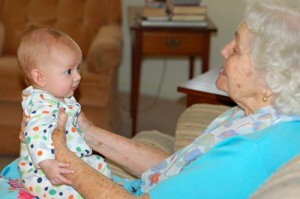 We stayed with Alan’s grandparent’s, but also were able to get some time with the Carter and Bullock side of the family. It is always great to see Steve and Angie and their gorgeous kids, but Sarah was also in town with her awesome boyfriend! Jack LOVED his play time with Grace and Graham and I LOVED the break as there was no shortage of hands that wanted to hold Colin. Grace was being such a sport! Jack wanted to hunt for snails and she was totally playing right along! My quiet and reverent Jack – at least in this instant! Funny what the trickery of a camera can show! haha! 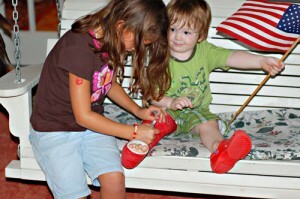 Sweet Grace signing Jack’s cast. She wanted to do that so badly all evening but Jack was in his “NO” mood. He finally relaxed and let her sign it. Look at his face and the way he is looking at her. Such love!! 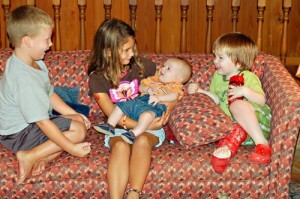 All four Carter cousins in the SAME PIC! Didn’t know this was possible! 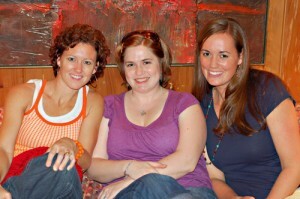 Wish I could see these sweet girls more often! LOVE my time with them. HUGS! Can’t ever forget about Granmom and Pawpaw! 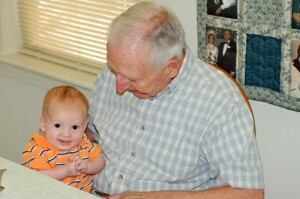 We are so blessed that our boys have this time to know their great grandparents. I hope my boys can be old enough to remember them later in life. 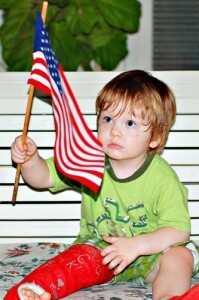 I will always remember my Mimi Dana and Pappy with such joy – I want that for my boys as well! UGH! What a crazy week and a half! I feel like I am finally getting my head above water today, thankfully – so I thought best to post now before I accidentally slip back under. 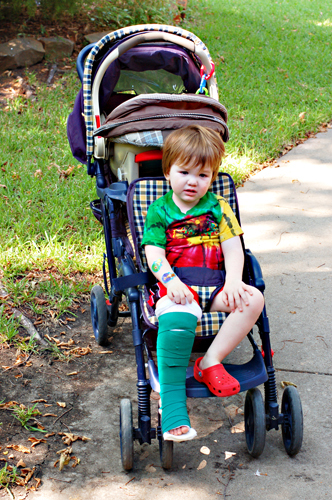 Jack has learned to be quite mobile on his cast – crawling and scooting around- making it possible for him to start preschool! We missed the first week due to his leg but I really thought that given his increased mobility (and my increased need for a break!) that it would be a win-win. So, Tuesday was his first day and he had a wonderful time! I sent his stroller with him so they could cart him around to chapel, computer time, outside etc. I didn’t get any complaints from his teachers, although I am sure it was a little extra work. The director had a 3rd teacher in his room to help out, so I am sure that made things easier. So today was to be day 2 but we are home again! Last night he had a low grade fever and several spots on him. Jack is a pretty rashy kid and breaks out easily, but since these spots were starting to look like chicken pox spots, I thought it best to keep him home. If you remember, he did this a year ago too; he looked like he was getting chicken pox, and it turned out to not be that at all. Last night after his bath, however, he broke out in what seemed to be hives all over his arms and legs. He was really worked up at the time and I am sure that the stress of the cast along with starting a new school coupled with MY stress over all of this was really taking it’s toll on him. I gave him some benadryl and this morning most of the spots do seem to have gone away but he still has some and feels a little warm so we are having another lazy day at home. He could very well have chicken pox which caused the hives but he also has a runny nose so this all just might be a reaction to some little bug that is in him. Jack just loves to keep his mama on her toes! haha! So far, Colin seems ok. He also had a low grade fever yesterday but seems fine today. Just as I thought I was at my whits end this morning, Jack leans over to me, hugs my arm and says “You’re my friend, Mama – I love you.” I love you too, angel! 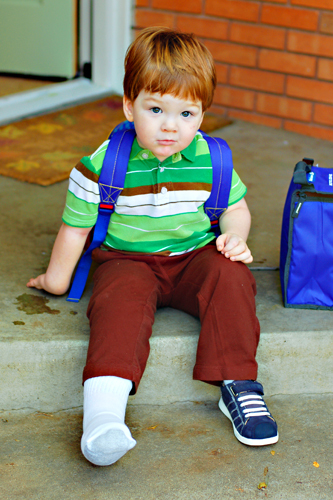 To end on a happy note – here is Jack on his first (and so far only) day of preschool! Even though it is often hard for me to say it or show it, Lord, I am eternally grateful for my dear sweet boys and all the exciting challenges they give me everyday! Thank you for giving me the time to be with them to see them grow and learn! I know you are the only one who can truly heal and protect, so into your hands, Lord, I give my babies. Well, we have our first major injury with the Melson boys. 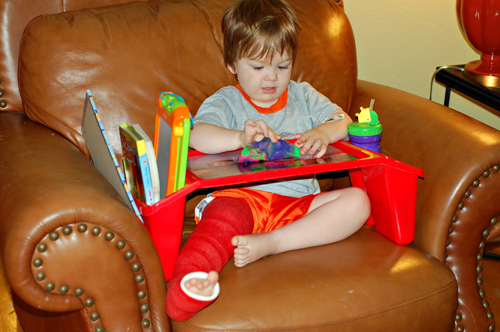 Jack broke his right tibia just below his knee on Saturday night during an impromptu trip to the park. Jack was being so fearless on all the tall ladders and slides. Alan was so proud of him since normally exhibits so much fear on these things. When he told Alan he wanted to go down the enclosed winding slide Alan thought he would let him and went with him, of course. On the second trip down the sole of Jack’s rubber shoe was caught on the edge of the slide and sent his leg up and back while the rest of them kept going. Jack seemed pretty freaked out by all of this and so Alan brought him home. When I held him in my lap I don’t think he has ever grabbed me so hard nor screamed quite like that. It was a deep guttural groaning scream. I too just thought he was really freaked out. After we calmed him down a bit we moved his leg, bent his leg, put pressure on it etc. There were no real signs of a break other than he would not put weight on it. So, we bathed him and put him to bed. At 2:30am he must have had to go to the bathroom because he got halfway out of bed and realized he couldn’t walk and yelled out for us. That next morning he seemed fine to sit on the couch etc, but could not put an ounce of weight on the leg. The pediatric urgent care doesn’t open until noon, so we waited until then to take him in to get an x-ray. 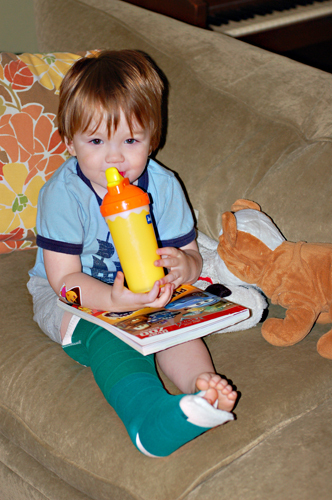 Sure enough there was a tiny hairline fracture of his tibia. They splinted him up and sent us home. Before we left he said to Alan “I’m sorry for hurting my leg on the slide, Daddy - it’s all my fault.” Sweet baby – accidents happen! Yesterday I got in touch with my pediatrician who referred me to an orthopedic that put a bright red cast on – at Jack’s choosing. This has been a less than pleasant experience for all of us. There have been a lot of tears from both Jack and me during this process. I have to carry Jack everywhere (all 37 lbs + the weight of the cast) and do everything for him – while still caring for and nursing Colin, but I am blessed to have them both and to have this time with them! He did have to miss his first day of preschool today. I was so looking forward to taking his sweet little picture on the front porch of him with his backpack and lunch box – but that will have to wait. Sigh. Jack about to get the splint while enjoying a blue highfrustosecornsyrupsicle. HAHA! Hey, it made him somewhat happy. Finding a little bit of freedom! 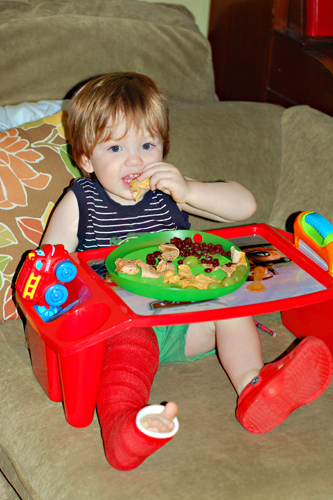 Home from getting his cast enjoying dinner on his new “Cars” tray table from his Juju. If you have ever had children, want to have children or just love babies – you will be moved beyond words by this video. As I watched this it reminded me of the saying “God never gives us anything we can’t handle”. No matter how weak we think we are – our Lord has a plan and sees our true strength. A strength that is only found in Him. I have no more words. 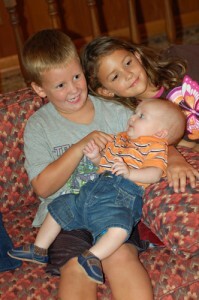 I will be hugging my sweet babies even tighter tonight, though and thanking God every second for my time with them!